The Price is Right Video Slot Review - Casino Answers! The Price is Right is a 5-reel, 25-line video slot found at Random Logic casinos, featuring a wild substitute symbol, scatter wins, multipliers, sidebets, a free spins feature and three bonus games. You can play the Price is Right video slot at Bovada. Bets on the Price is Right slot machine are $0.05, $0.10, $0.25, $0.50, $1, $2, $5 and $10 per line. You can select from 1 to 25 paylines on a spin. The minimum total bet is a nickel per spin up to the maximum total bet of $350 per spin (or $250 without the Big Wheel feature). The Price is Right online slot has a very good betting range, suitable for all sorts of online casino players. To play the Price is Right slot game, select your bet and press the “Spin” button. You can also use the “Max Lines” button to spin the reels with all 25 lines enabled. The highest paying symbol on the Price is Right video slot is the Model symbol, which can pay out up to 2500 coins. It can be multiplied by up to 5X by using the Big Wheel feature. Another high paying symbol is the Wheel symbol, which can pay out up to 1000 coins. To activate the Big Wheel Bonus, play 25 lines plus 10x your current bet per line. The Big Wheel will spin with each spin you make on the Price is Right slot machine. When the wheel stops, the arrow on the wheel will point to a prize that you will win. You can either win a multiplier of the Mini Game feature. If a multiplier is won, the multiplier will be applied to any win on the reels for that spin. When betting the Big Wheel Bonus, scatter prizes are multiplied by 25X bet per line. Use this feature to increase your winnings when playing at Bovada! The Host is the wild symbol on the Price is Right slot game. The Host wild symbol only appears on reels 2, 3 and 4 and will substitute for all other symbols except for the Scattered Logo symbol. Whenever 3 Host wild symbols appear on the screen, you will trigger the Mini Game feature. The Mini Game feature can also be triggered from the Big Wheel Bonus. 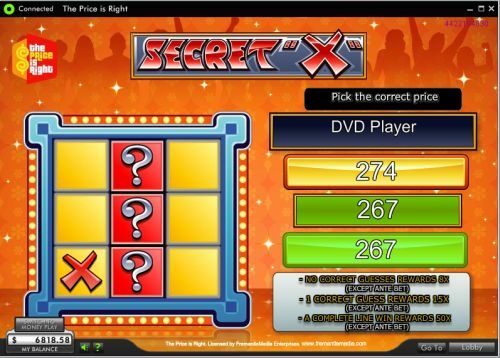 You will be able to choose either the Secret X bonus game or the Cliff Hangers bonus game. The Mini Game feature cannot be re-triggered and the Showcase bonus game cannot be won from a Mini Game. If you choose the Cliff Hangers feature, you will win 8 free spins. Following the free spins feature, a Hiker will climb up a cliff. Get the Hiker to stop to get your free spins feature win repeated between 3 and 7 times. You can choose to stay with a safer bet or continue climbing for a higher multiplier. If the Hiker falls, your free spins win will be doubled. The Cliff Hangers feature cannot be re-triggered. Free spins are played at the lines and bet of the trigger game, except that the Big Wheel is removed. Free spins feature wins are added to payline and scatter wins. The scatter symbol is the Price is Right Logo. You can get a scatter win by hitting two scatter symbols or up to a 10X scatter win for 3 symbols. The Scattered Logo only appears on the first three reels. If it appears on all three of those reels, you will trigger the Showcase bonus game. The Showcase board is shown with the Car locked in position 7. You must set the items in order from lowest to highest. Items in positions 1 and 2 are shown, followed by 3 and 4 and then 5 and 6. A prize of 5X your bet is won for each correct selection that you make. If all selections you make are correct, you will win a bonus prize of up to 100X your bet. Payouts are made according to the Paytable. All symbols pay left to right, except for the Scattered Logo (which pays any). Payline wins are multiplied by the bet per line. Scatter wins are multiplied by the total bet, except when the Big Wheel Bonus is being played. Scatter wins are added to payline wins. Highest win only on each selected payline. Coinciding wins on different paylines are added. All wins occur on selected paylines except for the Scattered Logo. Host appears on reels 2, 3 and 4 only and substitutes for all other symbols except for the Scattered Logo. Scattered Logo appears on reels 1, 2 and 3 only. The Price is Right video slot is an excellent presentation of the beloved game show. 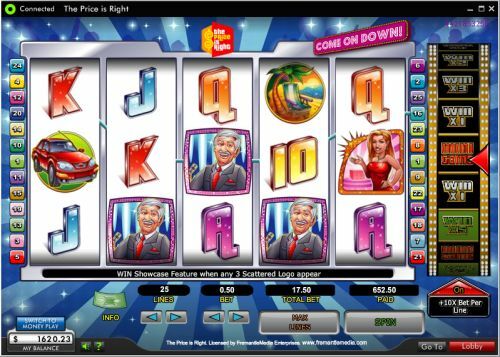 You want lots of bonus games and other special features and that’s exactly what this Price is Right slot game gives you – a whole lot of fun! It also does a good job at maintaining a lot of the feel and charm of the authentic Price is Right game show. It’s missing Bob Barker (and we’re glad it doesn’t include Drew Carey), but we understand you can’t have everything. You can play the Price is Right video slot when you sign up and make a real money deposit at Bovada! Where can USA players play the Price is Right online slot game for real money? Unfortunately, USA players cannot play the Price is Right video slot at Random Logic online casinos. On the bright side, there is a Price is Right inspired video slot called The Right Prize that you can play at Bovada. Where can I play a flash game of the Price is Right video slot? Yes, you can play a flash version of the Price is Right video slot at 888 Casino. You can play for free or real money. If you have any difficulties with the flash casino game, you can download the newest version of Adobe Flash Player. Is there autoplay on the Price is Right slot game? Unfortunately, the Price is Right slot machine does not feature an autoplay mode, so you will have to spin the reels manually. The Big Wheel can’t spin itself so neither can your slot machine reels! How do I get to the Showcase?! I need to know! You can get to the Showcase by hitting 3 scatter symbols on reels 1, 2 and 3. This is the only way to trigger the Showcase bonus game, whereas the other mini-games can be triggered by hitting the Host symbol 3 times or by spinning the Big Wheel.